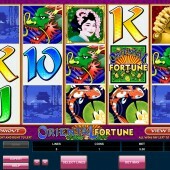 If ever a game was made for mobile casinos, it was slot developer Microgaming’s journey to the east, Oriental Fortune. Simple and colorful with some basic gameplay and even more basic pay-lines, this is suited for a quick game on the go. A shame, then, that Microgaming’s slot is online and not a mobile slot title. 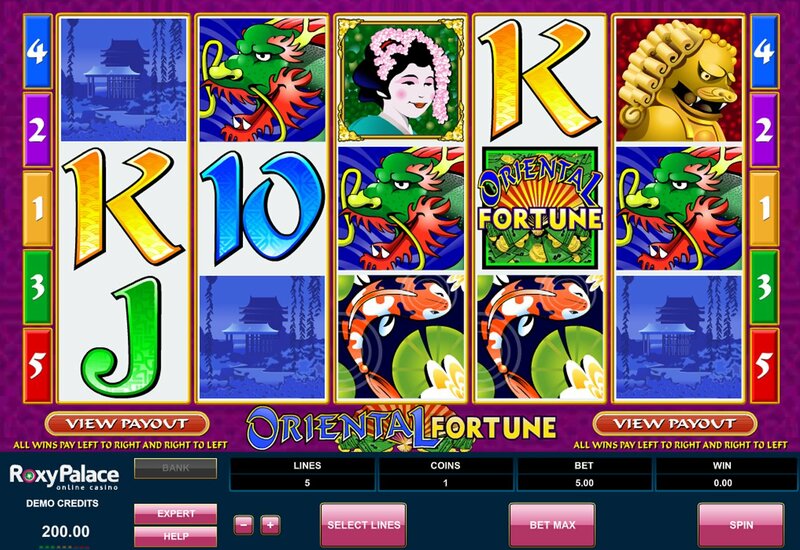 Oriental Fortune is a 5 reel, 5 pay-line online slot with reels filled with Geishas, Koi carp, pagodas, dragons of various colors, and standard 10-through-Ace symbols. You can definitely feel the Oriental vibe present on the reels but there really is a distinct lack of creative genius going on here. The beautiful Geisha acts as the game’s Wild symbol, and it substitutes for all regular symbols in the game. However, that little bonus is tempered by the fact there’s no multiplier attached. Five Wilds across the reels pays out a nice little 5,000-coin jackpot - $25,000 if you’re playing at the top coin limit. No Bonus Features or Free Spins! If you’re waiting for details on Oriental Fortune’s multi-layered bonus rounds, a generous free spins feature, or a nice progressive jackpot, apologies. Oriental Fortune’s, er, ‘fortune’, begins and ends with the Wild (we told you it was basic) and action junkies may want to hunt elsewhere for more Asian magic. Sadly there’s not even any animation when the Koi carp fall on the reels, unlike games like NextGen Gaming’s lush Eastern Dragon or Aristocrat’s land-based inspired Wild Panda that comes equipped with plenty of Koi, lotus blossom and pagodas. What’s more, Aristocrat’s game has 100 pay-lines and a nice bonus round, so my advice is to hunt out that gem before blindly lumping with Microgaming’s offering.